After my grandmother passed, my mom and her siblings tearfully went through her home, cleaning and packing and selecting small keepsakes with personal meaning. My mother thoughtfully gave to my sisters and me clippings from Grandma's hoya plant. 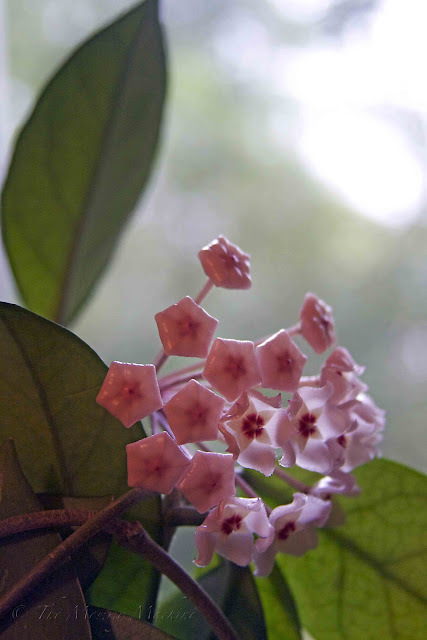 I was amazed at how quickly my little sprig took root, and the hoya continues to grow large and leafy all these years later on a sunny windowsill in my house. It will sit there for months with its plain green leaves, and then surprise me with fragrant blossoms that seemingly form overnight. They are so lovely. Just like my grandmother. It's a lovely idea. I find them quite sticky. What a beautiful little flower! I've never even heard of it!